The Australian Dollar launched a brisk recovery last week, pushing to the highest level in three months against its US counterpart. While the RBA monetary policy announcement repeated the now-familiar status quo, a round of supportive economic data proved to be a potent catalyst. The central bank once again argued in favor of a sustained period of stability in monetary policy. That has re-framed speculation to focus on which direction rates are likely to go once that period runs its course, and last week’s news-flow seemed to argue for tightening. The fourth-quarter GDP report topped economists’ forecasts, showing the year-on-year growth rate accelerated to 2.8 percent and marked the highest reading since the three months through December 2012. Meanwhile, retail sales unexpectedly jumped 1.2 percent in January to yield the largest increase in 11 months. Group showed hiring in the service sector, which employs close to three quarters of the labor force, expanded for the first time in three months in February. This increases the probability of an upbeat outcome, bolstering bets on a rate hike cycle to be initiated after the current standstill. A strong-enough result may even hasten the timeline for its expected commencement in the minds of investors. Needless to say, such a scenario would bode well for Aussie. External factors remain an important consideration however and may undermine the Australian unit’s prospects. The US economic calendar is expected to yield a pickup in retail sales and an improvement in consumer confidence. On the “fed-speak” docket, the spotlight will be on Senate confirmation hearings for Stanley Fischer, Lael Brainard and Jerome Powell. The former is nominated for Fed Vice Chair while the latter two are to be Governors. Comments from Mr Fischer – until recently the Governor of the Bank of Israel and formerly a high-ranking official at both the IMF and the World Bank – will be in focus. He has vocally supported US monetary policy normalization in recent months, suggesting he will add to the chorus of pro-“taper” rhetoric from other Fed officials. Taken together, the arrival of these catalysts on the heels of Friday’s upbeat US payrolls data has scope to significantly reduce speculation about a possible deceleration of the QE cutback cycle. That may undermine risk appetite, weighing on the Aussie in the process. 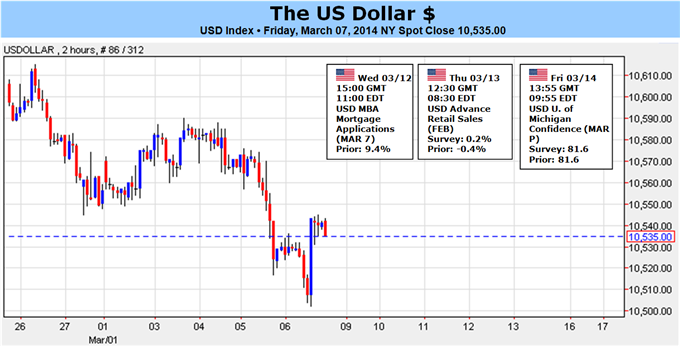 US Dollar Sharply Lower as S&P Surges - What Could Change That? The US Dollar finished the week sharply lower against major FX counterparts, but a better-than-expected labor market report forced it off of multi-year lows into Friday’s close. What’s next for the Greenback? A relatively quiet US economic calendar in the days ahead leaves focus on broader financial markets and Dollar drivers. Fresh record-highs in the US S&P 500 hurt demand for the US currency, and we may need to see an important pullback in ‘risk’ for the Dollar to stand a chance at meaningful recovery. It initially looked as though stocks would take a hit as rising tensions between East and West simmered to a boil in Ukraine over the weekend. An ease in rhetoric nonetheless sparked a dramatic comeback in the S&P and a sharp drop in the US Dollar. Suffice it to say, however, the situation remains fluid and the end game is not clear. Vested economic and geopolitical interests in Ukraine (from both Russia and the West) should be enough to have cooler heads prevail. It is arguably for that reason that Eastern European troubles have not sparked broader emerging market contagion and financial market distress. Yet we need only remember comparatively minor problems in Argentina sparked significant Emerging Market and Developed Market sell-offs—leading to important US Dollar strength. A mixed bag for US economic data results otherwise leaves USD forecasts less clear. On the one hand, the world’s largest economy has clearly seen a slowdown in growth through early 2014. On the other, modestly positive labor market trends and other factors suggest that the US remains on firm footing. The Greenback may continue to benefit from expectations that the US Federal Reserve will continue the so-called “Taper” of its Quantitative Easing policies at its March 19 meeting, but is it enough? US Treasury Yields have fallen considerably from recent peaks, which hurts the USD particularly against the yield-sensitive Japanese Yen. It might take a substantial improvement in US economic results to force a meaningful bounce in domestic yields and interest rate forecasts. The Dollar remains out of sorts as safe-haven demand seems non-existent, and even the potential for armed conflict in Eastern Europe hasn’t been enough to force a meaningful pullback. Our forex sentiment data warns that the US currency may be at a substantial sentiment extreme versus the Euro, Swiss Franc, and New Zealand Dollar. Yet sentiment can and has remained extreme for longer than any trader can remain solvent. We’re watching for Dollar weakness at these levels, but it may take relatively little to force a significant pullback in “risk” and a similarly important Dollar bounce. Gold is firmer at the close of trade this week with the precious metal up by nearly 1% to trade at $1335 ahead of the New York close on Friday. Tensions regarding the ongoing geopolitical dispute in Ukraine propped up gold prices early in the week with spot turning just ahead of technical resistance at $1357. Gold has since traded within the March 3rd range with major US economic data on Friday offering little support for the 2014 rally. The US employment report on Friday was the highlight of the week with non-farm payrolls adding 175K jobs last month, toping expectations for a print of just 149K. The unemployment rate unexpectedly rose to 6.7% from 6.6% and while this would typically be seen as a negative, the move was accompanied by a broadening in the civilian labor force- a factor that will inherently elevate the headline rate. 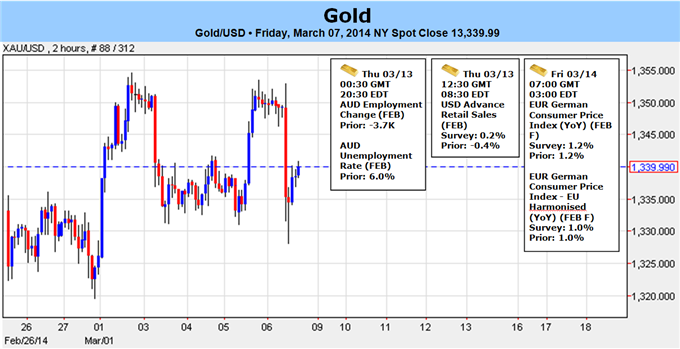 Gold immediately came under pressure on the release as concerns over the widely debated impact weather had on jobs abated. That’s said, it’s likely the Fed will continue tapering QE purchases as expected and the bid for gold (at least from an inflation standpoint) is likely to be limited barring any additional geopolitical risk. Looking ahead to next week, investors will be closely eying retail sales data and the preliminary March University of Michigan confidence numbers. Gold prices are likely to take direction from broader market sentiment with our attention shifting on the USDOLLAR’s recent rebound at key Fibonacci support on Friday at 10,508. Should this rebound materialize into a more substantial advance, look for gold prices to remain under pressure. From a technical standpoint, gold remains at risk below key resistance at $1357/61 with a clean monthly opening range highlighting support into $1330. Look for a decisive break of this range mid-next week to offer clarity on a medium-term bias heading into March with our immediate focus against the $1357/61 resistance range. A daily RSI support trigger looks to have been broken on Friday’s decline and a move below the March opening range puts support targets into view at $1320 and $1300/06 where more substantial demand is expected. Only a break below the $1268/70 support level would put the broader decline off the 2012 high back into play while noting that a break above the $1361 threshold suggests that a much more significant low was put in place last December. Such a scenario would eye topside objectives towards the August highs at $1433. The GBPUSD pulled back from a fresh monthly high of 1.6784 following the better-than-expected U.S. Non-Farm Payrolls report, but the British Pound may continue to coil up for a move higher as the Bank of England (BoE) moves away from its easing cycle. Indeed, the Monetary Policy Committee (MPC) refrained from releasing a policy statement after retaining its current policy in March, but it seems as though the central bank will do little to halt the appreciation in the sterling as it helps to achieve the 2% target for inflation. 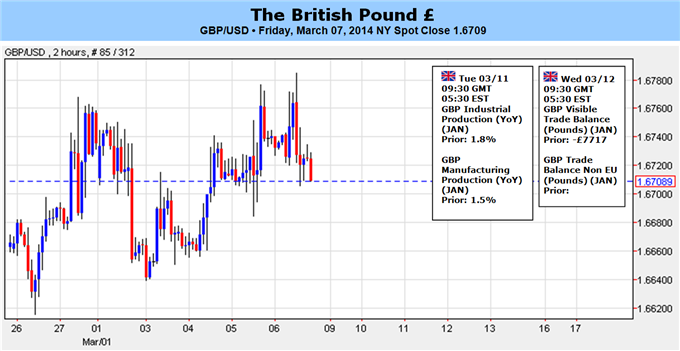 Beyond the U.K. data prints on tap for the week ahead, Governor Mark Carney, Paul Fisher, David Miles and Martin Weale are scheduled to testify in front of Parliament’s Treasury Committee on March 11, and the fresh batch of central bank rhetoric may spur a bullish reaction in the GBPUSD should we see a growing number of BoE officials show a greater willingness to normalize monetary policy sooner rather than later. With that said, we will retain a bullish outlook for the GBPUSD as it appears to be carving a higher low above the 1.6600 handle, and will continue to look for a move into the 1.6850-60 region, the 78.6% Fibonacci expansion from the October advance, as the Relative Strength Index (RSI) preserves the bullish trend carried over from the previous year. The US dollar and the Japanese yen were sold off as the market mood improved. Will we see more falls? Rate decisions in Japan and New Zealand, US employment and retail figures as well as PPI and Consumer confidence are the major events on our calendar. Here is an outlook on the highlights of this week. Japanese rate decision: Tuesday. Bank of Japan maintained its monetary policy in February, stating that the economy was moving in line with the central bank’s projections, indicating monetary stimulus will not get bigger. However in case of downside risks, the BOJ will act and adjust its policy. The GDP release showed external demand has weakened in emerging market economies affecting growth, but domestic demand has remained strong. The bank also forecasts that the current account balance will also improve once exports strengthen alongside global recovery. US Federal Budget Balance: Wednesday, 18:00. The U.S. government’s deficit continued to decline in January reaching $10.4 billion. The ongoing reduction totaled 36.6% in the first four months from a year ago, signaling further improvement in the nation’s economic condition. The Congressional Budget Office expect deficit to reach $514 billion in the current budget year while last year deficit reached $680.2 billion. The US Senate passed legislation to suspend the debt ceiling until March 16, 2015 eliminating more risk for budget wars. U.S. government’s deficit is expected to reach $223.2 billion. NZ rate decision: Wednesday, 20:00. New Zealand’s central bank kept rates unchanged in February but gave a strong hint for a rate hike this month. While inflation has been moderate, inflationary pressures are predicted to rise over the next two years. The RBNZ’s decision followed strong data indicating the economy is growing faster than the central bank had projected, while inflation got closer to the RBNZ’s 2% target. A rate hike to 2.75% is expected this time. Australian employment data: Thursday, 0:30. Australia’s unemployment rate worsened in January increasing to 6.0% its highest level in a decade. The Australian economy shed 3,700 jobs due to a turbulent transition away from mining and the jobless rate increased from 5.8% in December, mainly full time positions. Australia is facing an economic transition following the termination of the mining boom, reflected by a big drop in mining related investment. Other sectors in the economy will have to fill in the gap and start contributing to growth. Australia’s unemployment rate is expected to remain unchanged at 6% while the Australian economy is predicted to add 15,300 new jobs. US retail sales: Thursday, 12:30. US retail sales edged down in January, amid cold weather Americans spent less on automobiles and clothes following the rise in the end of 2013. Retail sales fell a seasonally adjusted 0.4% after a 0.1 percent drop in December. However, economic slowdowns caused by winter weather are usually transformed to stronger growth once temperatures rise again. Nevertheless economic growth in the first quarter is expected to be well below 2% annual rate compared to the 3.2% rate in the final quarter of 2013. Meanwhile Core retail sales excluding volatile spending on autos, gas and building supplies, remained flat compared with December with a drop in purchases of clothing and furniture because of rising prices. Retail sales are expected to gain 0.3%, while core sales are forecasted to rise 0.2%. US Unemployment Claims: Thursday, 12:30. The number of Americans queuing for unemployment benefits fell to a three-month low last week, indicating the US labor market has recuperated from the severe weather. Initial claims for state unemployment benefits declined 26,000 to a seasonally adjusted 323,000, better than the 326,000 projected by analysts. The continuing claims have stayed at higher levels in recent weeks, due to the cold weather preventing some recipients from going out to search for work and causing companies to delay hiring. A rise to 334,000 is expected this time. US PPI: Friday, 12:30. U.S. producer prices increased in January, but did not reflect broader price pressures in the economy. The producer price index for finished goods edged up 0.2% on a seasonally adjusted basis, following a 0.4% increase in December. PPI was revised and now includes the wholesale cost of goods and adds services, construction, government purchases and exports for the first time. It now includes a new index that tracks prices of goods and services meant to be sold to consumers. The index, known as personal consumption, rose 0.3%. It’s expected to give a heads up if consumer inflation is about to begin a sharp move up or down. The rise in prices does not indicate any major shift in inflation. Meantime, PPI, excluding the volatile categories of food and energy, edged up 0.2%. Producer prices are expected to gain 0.2%. US UoM Consumer Sentiment: Friday, 13:55. Consumer confidence in the US remained unchanged at 81.2 points in February, indicating shoppers remained dormant last month. However economists expected the index to decline to 80.6. However, the figure indicated a worsening mood after December’ release showed a three-year high on a monthly basis. Consumer confidence is expected to rise to 81.9. The dollar rose to six-week highs against the yen on Friday and pulled back from two-and-a-half year lows against the euro after data showed that the U.S. jobs report for February came in ahead of expectations. Japan is to release data on the current account, as well as revised data on fourth quarter economic growth. In the euro zone, France is to produce data on industrial production. Switzerland is to publish data on retail sales, the government measure of consumer spending, which accounts for the majority of overall economic activity. Australia is to produce private sector data on business confidence. The Bank of Japan is to announce its benchmark interest rate and publish its monetary policy statement, which outlines economic conditions and the factors affecting the bank’s decision. The announcement is to be followed by a press conference. In the euro zone, Germany is to release data on the trade balance, the difference in value between imports and exports. The U.K. is to publish data on manufacturing production. Meanwhile, Bank of England Governor Mark Carney and several monetary policy committee members are to testify on inflation and the economic outlook before Parliament's Treasury Committee. Australia is to release private sector data on consumer sentiment, as well as official data on home loans. Japan is to publish its BSI manufacturing index and a report on tertiary industry activity. The U.K. is to produce data on the trade balance. The euro zone is to release data on industrial production. The Reserve Bank of New Zealand is to announce its benchmark interest rate and publish its monetary policy statement, which outlines economic conditions and the factors affecting the bank’s decision. The announcement is to be followed by a press conference. Japan is to publish data on core machinery orders. Elsewhere, China is to produce data on industrial production and fixed asset investment. Australia is to publish data on the change in the number of people employed and the unemployment rate, as well as a private sector report on inflation expectations. RBNZ Governor Graeme Wheeler is to testify before the Finance and Expenditure Select Committee, in Wellington. The ECB is to publish its monthly bulletin, which looks at current and future economic conditions from the bank’s perspective. The U.S. is to release data on retail sales and import prices, in addition to the weekly government report on initial jobless claims. The BoJ is to publish monetary policy meeting minutes, which contain valuable insights into economic conditions from the bank’s point of view. Switzerland is to release data on producer price inflation. The U.S. is to round up the week with data on producer price inflation and preliminary data from the University of Michigan on consumer sentiment. Last edited by 1Finance; 03-09-2014 at 11:34 AM. The dollar rose to its highest level against the yen in six-weeks on Friday after the U.S. employment report for February came in ahead of expectations. The BoJ is to announce its benchmark interest rate and publish its monetary policy statement, which outlines economic conditions and the factors affecting the bank’s decision. The announcement is to be followed by a press conference. Japan is to publish data on core machinery orders. The dollar trimmed back losses against the Swiss franc on Friday after data showed that U.S. jobs growth exceeded forecasts in February, reinforcing expectations that the Federal Reserve will continue to unwind its economic stimulus program. The U.S. dollar jumped higher against the Canadian dollar on Friday after the U.S. jobs report for February came in ahead of expectations while Canada’s jobs report was unexpectedly weak. Canada is to release data on building starts. Canada is to release data on new house price inflation. The Australian dollar fell from a three-month against its U.S. counterpart on Friday, after Reserve Bank Governor Glenn Stevens said the exchange rate is "high by historical standards".